One of my biggest gripes with God of War is that it could care less that I have a life. This is ironic because it’s something you don’t often struggle with in open world games, especially ones with the option to save at any moment like you can here. Unfortunately regardless of where you are and what you are doing, reloading your save will place you in a different location than you were when you left off and in extreme cases can confuse you as to what to do next. 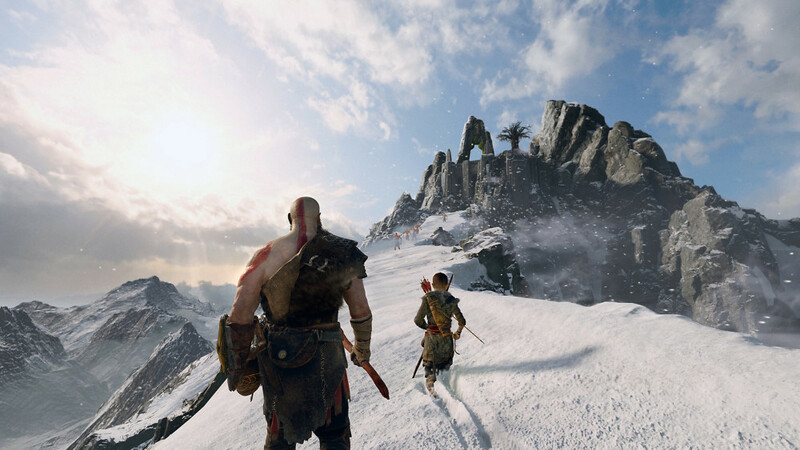 Not only that, but for all the maps, tracking, and fast travel that is implemented in God of War there’s inevitably going to be a ton of wondering around trying to find the item/location that you are hunting down. It’s not common in the main campaign, perhaps an area or two will be difficult to find or reloading in a cave will have you running in the opposite direction for a minute, but when you’re trying to hunt down that last artifact or raven it can be downright maddening. It’s almost worse in my eyes that I’m told I have 8 out of 9 of the artifacts rather than telling me which one of the nine I need. The same is true of all kinds of collectibles in the game. The result is a boring and frustrating “Where’s Waldo?” search for the item or two you wish to seek. “Why are you seeking this?” you might ask. That’s also not explained. Sometimes it’s for good gear/loot, other times its for XP, and finally there’s the ultimate carrot on the stick, a trophy. In most cases you won’t know what you’re going to get until you are awarded it and the entire time you’re playing through the game you’re building up to these larger goals that will later take hours to complete. After a 30 hour campaign not all players will be keen on hunting down 2 missing artifacts, but it’s the fact that you’ve put in 30 hours and you’re only two away that pulls at certain gamers such as myself. This kept me running around hunting like an idiot for well over 5 hours after finishing up all the hunting I wanted and with only one artifact left to find, two ravens left to kill, and an endless sea of guides and screenshots I gave up. You know what’s worse than spending 5 hours looking for around 5 collectibles? Looking for 5 hours and still being shy the one or two to achieve your goal. Some can cut their losses like me and walk away dissatisfied while I’m sure there are others who go crazy trying to find that final item and may even be hunting for them to this day. If your best case scenario is for the player to walk away disappointed then you’ve failed in the goal I hope you’re trying to achieve: extend the game content that the player is enjoying. All of this comes down to a game that doesn’t care how much time I have and wants me to spend more of it doing menial tasks. 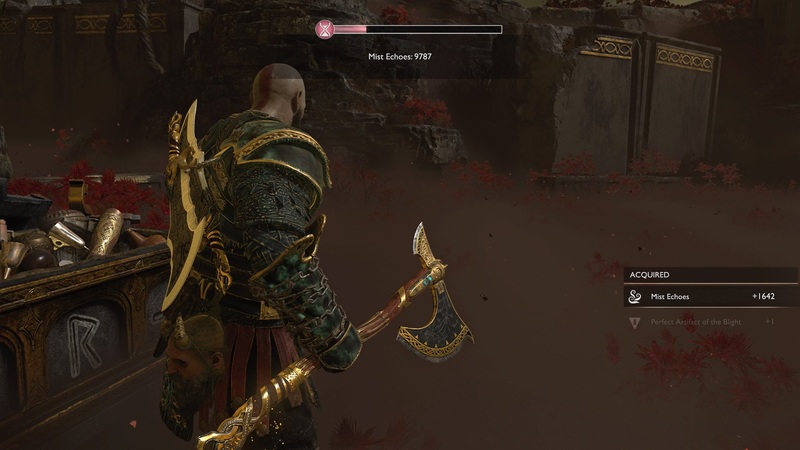 So you want to complete all the challenges God of War has, do you? Want to finally conquer Muspelheim’s deadly sixth area? Want to beat those secret extra bosses that reward you greatly? Want to fully upgrade your weapons? In order to do all of this, you’ll eventually need to run over to Niefelheim and start grinding away to buy all of these sacred items. Yes, I said grinding. 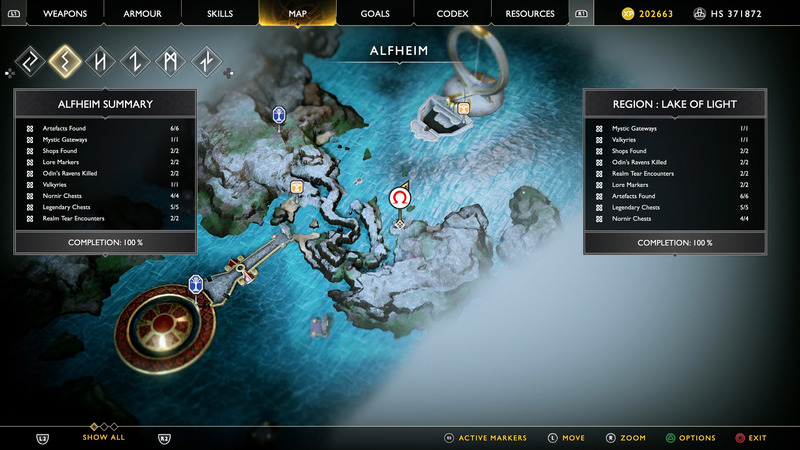 Niefelheim is nothing more than a diamond-shaped “maze” with two random off-shoots that contains bouts of random enemies that you need to overcome all while a timer ticks down and the threat of losing everything riding in the back of your mind. You’ll collect various currencies for crafting and upgrading, but all of it is lost if you die or the time runs out before you return back to the home base at the bottom of the diamond. What starts off as a fun little obstacle course will eventually become an exhausting endless sea of grinding as you whittle away 5-10 boring hours of the same random encounters to collect enough mist echoes to open new challenges or craft/upgrade armor. It’s literally like a side portion of the game that combines random encounters from the likes of an early Final Fantasy game with the punishing loss of everything upon death like in Rogue. It’s also exhausting if you’ve already played through most or all of the game and at that point there’s little reason to have all these great items that you have nothing to use them on. Still, if you’re going to go for the big bad Valkyries and “prove your worth” then you’ll definitely need to spend your hours in this repetitive pit of game padding. You could always walk away, which I highly recommend. It was a very poor idea to do this portion immediately before going into the late parts of the story like I did, but then I also got to appreciate my fully upgraded armor and weapons by pulverizing the rest of the campaign challenges. Even before this game came out both games press and lucky early players were talking about the Valkyries. Anyone who has read up on Norse mythology could probably have guessed they would be in the game and it’s somewhere around the 2/3 mark of the story that you most likely come in contact with your first one. At first I found the Valkyrie to be very difficult bosses designed to test my skills at the game to their peak, but after defeating the first two with standard weapons and armor, I was finding myself unable to get most of the others down to more than half health. I even asked a friend who had beaten them all if the upgraded armor and weapons were the key to winning and he said it was more skill. I can now say that is all complete and utter crap muttered by an individual who wanted to pat themselves on the back as a good player rather than a good grinder. The Valkyrie are pretty freaking easy when you have all the upgraded equipment and it’s clear that this was the intended circumstance you’re supposed to fight them in. After crafting my favorite mist armor and fully upgrading my weapons and wiping the floor with the remaining six Valkyrie, I was honestly disappointed in the fact that the real challenge was to adjust my damage/prevention to the point that the game was pleased with my grinding. This is further accentuated by Sigrun, the Valkyrie Queen, who to this day I’ve not beaten. Over at Kotaku Kirk Hamilton did a great breakdown of the fight if you need it, although he seems enchanted by the pathetic late tactics she employs. I love the way that you get stomped the first few times, the culmination of all of the other Valkyrie moves, and the intense length of the battle. I was also really appreciating the patterns you have to learn that hearkened back to the 8-bit and 16-bit days of my boss fights, but this fight eventually becomes a stupid exercise in futility. I’ve done enough damage on her to be sure she’s beatable, but the way the game inaccurately gives her a hit or fails to detect your dodge or, and this is the worst, suddenly break the lock on the camera points out the fatal flaws employed to make this boss seem impossible when she’s really just cheap. If you can handle a great deal of swearing and pain, watch me tackle 45 minutes my sixth hour of battling this brutal boss only to come up empty handed. I get her down to nearly dead every time, in some cases working her patterns like choreography only to have it all stripped by either a cheap unblockable move or more often one of those aforementioned flaws in the game’s battle system that only seemed to appear for this battle. In the end even if I popped in the game and beat her first time today, I won’t feel accomplished, I’ll feel lucky. I don’t want to overcome the most brutal boss in a game – and many are saying one of the most brutal bosses of all time – by luck. It all leaves a bad taste in my mouth. After all this griping and tearing down a game I earlier claimed to be a “masterpiece” there has to be a takeaway. For me it’s the fact that I’m clearly getting older, my time is more precious to me, and perhaps I’m not the ideal person to be a completionist anymore. Sure, side quests are worthwhile and I can’t imagine why I’d stop doing them, but perhaps there’s little to no value in me finding every flag in Assassin’s Creed or every raven in God of War. Today’s games are pathetically loaded with icons on the screen (or hidden behind mini checklists like in this title) and little of it has any intrinsic value, especially if you’re just doing the main storyline. I think it’s time I admitted that these chores are self-inflicted and no one made me fight the Valkyrie Queen for six hours other than myself, so I am truly my own worst enemy. I’m glad I got to play God of War even if I wish I had shown the restraint to avoid doing so many optional tasks that proved to not be enjoyable for me, but also tarnished my appreciation for the real joy of that game. As I move on to future games I’ll try to remember this experience and be aware that this is no longer my idea of fun. 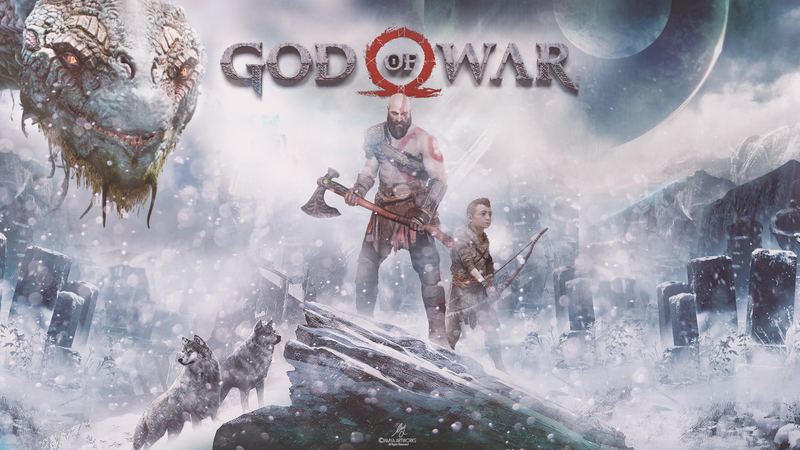 I got a hint of it while getting nearly 100 percent in both Assassin’s Creed Syndicate and Horizon Zero Dawn, but for whatever reason I ignored those sentiments with God of War. I’ll try not to make that mistake again. At the same time I’m currently replaying Tomb Raider Definitive Edition and enjoying every second of doing a 100 percent completion of that game, so I guess it really just depends on if I’m having fun or not. I close with a question: what about you? Have you had similar thoughts to me or were you never a completionist in the first place? If you were and walked away from the practice, what was the game that broke you? I don’t think you are supposed to 100% that part of the game. It is just little bonuses for you to stumble upon while you play the game. The odd part to me is the expectation that you were supposed to 100% the game. It was kind of assumed and so people felt like a bait & switch was going on. Point of this whole story, when did “completion” mean doing everything possible and not just what you want to do in a game?